The EU’s goal to collect and recycle 70% of household waste is unattainable and should be scrapped, write Elbert Dijkgraaf and Raymond Gradus. There is a heavy policy discussion on whether it is wise that the European Union will introduce a household waste recycling rate of 70%. In July 2014, the European commission announced in their circular package of waste that every member state should meet this target in 2030. 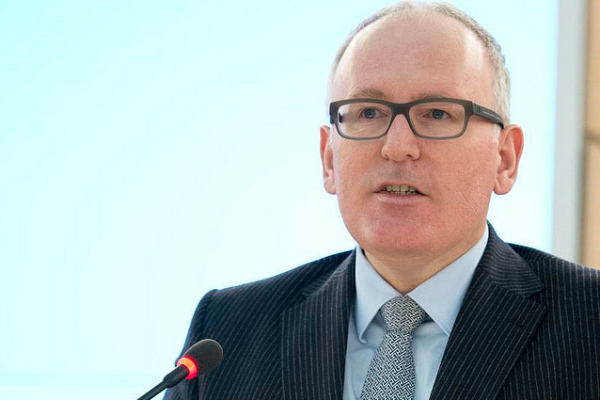 Recently, despite large opposition of EU environment ministers and some MEPs, Commission First Vice-President Frans Timmermans did proclaim to skip this legislation in his deregulation plan. We believe it is wise to do so for at least two reasons. First, it seems nearly impossible to reach the EU-goal of 70% with available policies as can be shown for the Netherlands. Although the Netherlands already years ago invested heavily in recycling policies, this is still a large challenge as nowadays on average this rate is approximately 50%. The recycling rate dropped even from 50% in 1998 to 48% in 2012 and nearly no Dutch municipalities have a rate above 70%. Based on a large panel data set for the Netherlands, it can be shown that unit-based pricing, avoiding a duo-bin for unsorted and compostable waste, and moving back the frequency of collecting unsorted and compostable waste at the curbside are effective in raising the recycling rate. However, only unit-based pricing with a priced bag for unsorted waste has a substantial effect. Nevertheless, such a system can have serious adverse effects. There is an incentive for households to put as much waste as possible in each bag, which makes them difficult to handle and labor legislation limits the number of bags carried per waste collection employee. In addition, for some Dutch (coastal) municipalities these plastic bags have another disadvantage as births like gulls will give extra nuisance. Furthermore, unit-based pricing may lead to illegal dumping. Moreover, in nearly all cases changing the frequency of collection of recyclables or applying another unit-based pricing system had no or small effects. Overall, the goal of 70% in the EU is for many municipalities out of reach as the bag-based system itself has only an effect of 25% at its maximum. Second, also the environmental benefits of introducing such a target are small and costs of separation and collection can be large. Recently, a research paper shows that average social costs are minimised with recycling rates well below mandated levels in Japan. Based upon the results of that paper, it appears that the 20% recycling rate in Japan is higher than the socially optimal rate (10%). There is some evidence that this is also the case for Europe. The Netherlands provides an interesting example. Lack of space forced Dutch government to take measures to reduce the landfilling of unsorted waste and to stimulate waste incineration in an efficient and environmental friendly way. Nowadays, all unsorted waste is incinerated to generate electricity and heat and the private and external costs are very low. Thus, also from an environmental point of view burning is not a bad alternative to recycling. In addition, the separation of waste necessary for recycling will have high (handling and transport) costs, both private as external, as well. Facts? Why is writer of this article Dijkgraaf ignoring the fact being member of parliament? http://www.tweedekamer.nl/kamerleden/alle_kamerleden/dijkgraaf-e-sgp. As the city of Amsterdam with 5% of the countries population decided last week to bring their target for separated household waste up to 65% in 2020 from around 15% now. Other mayor cities in the country are going the same way. The EU target will be easy to surpass!